First of all, any kind of mattress can be a pillow top. Even an airbed can be a pillow top. The problem is getting the best pillowtop mattress, not just any of them. As for what a pillow top is… In short, it’s exactly what it says on the tin. Well, sort of. It’s not like it’s an actual pillow attached to the top of a mattress. But it is close. 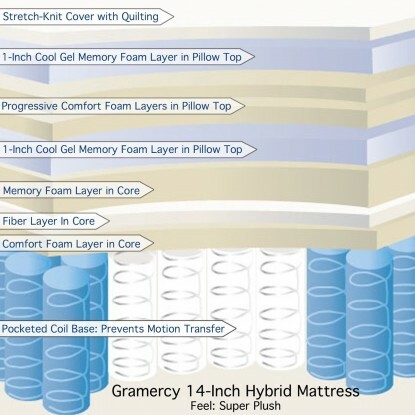 A pillow top mattress has an extra layer on top of the basic layers. The purpose of that layer is additional cushioning and support. The pillow top layer is usually plushy to the touch. It’s soft, and it’s also warm. Although, sometimes it can be used to make sure you don’t get too warm. Why a pillow top mattress? It’s not like I’m trying to force you to pick one. It’s a matter of taste. But, trust me, many a person prefers this kind of mattress. The pillow top often nullifies many qualities specific to the material of the mattress. Thus, an air bed becomes warmer to sleep on, a memory foam mattress reflects heat back at you less actively than usual, latex firmness doesn’t matter all that much, and the coils of an innerspring mattress won’t be biting your back anytime soon (besides, the pillow top does a good job at distributing the pressure from the springs). And then there is the cushioning. The plushy feel is sometimes all people are after. I didn’t mean it to. I’m not trying to seduce you into using a pillow top mattress. You can buy a memory foam mattress, or a latex mattress, or even the best innerspring mattress for that matter. The choice is ultimately yours. You are the one who will make it. But you need information to make that choice. And that’s what I’m providing you with. Pillow top doesn’t really have many qualities that cannot be attributed to taste. Because of that, it’s hard to generalize whether some certain quality is good or bad and why. And, like I’ve said, it doesn’t have to sound appealing. Are there any reasons for not using a pillow top mattress? The first and most important one would be your taste. If pillow top is not what you like there is no reason to pay for it. That’s very simple. However, there indeed are circumstances when you, perhaps, shouldn’t use a pillow top. One of them would be back pain. Don’t get me wrong, there are times when pillow top is exactly what your bad back needs, but usually, you need something firm. Whereas pillow top is soft by definition. It might be good for your back, but more often than not it wouldn’t be. Also, pillow top might interfere with memory foam. That’s unlikely, unless you buy a topper since the manufacturer should have taken care of them, but do know that memory foam performs best when it contacts skin as directly as possible. Other than that, pillow top nullifies anti-allergenic properties of latex. You don’t contact latex, therefore, most of its best properties are simply unneeded. Is any pillow top mattress a hybrid mattress? That would depend on how you define “hybrid mattress”. Technically, it is, since, just like in any hybrid mattress, there is an extra layer of different nature. And, as the name suggests, that layer is always on top. A hybrid mattress is a mattress that comes as it is. There’s no changing it. You can’t just remove whatever layer that makes it “hybrid”. Not so with pillow top. Even if it cannot be removed technically, it’s still an extra. Just like a cover. Of course, if you want a hybrid mattress, you can still get what you want. Pillow top interacts with the other layer in a manner similar to hybrid mattresses. This almost hybrid mattress comes in eight sizes: Twin, Full, Full XL, Short Queen, Queen, King, California King, and X-Long. There is a good reason I call it “almost hybrid”. While the mattress is an innerspring one, the pillow top has some memory foam in it. The height of the mattress is precisely twelve inches. Most of the height comprises 750 pocketed coils. Thanks to their structure and independence of each other, the construction completely eliminates any movements. You don’t have to worry about disturbing your partner or being disturbed by them. The coils give in under pressure, but they do not affect neighboring coils in any way. That in itself is enough to call the mattress great for sound and comfortable sleep. But, of course, there is the pillow top beside the mattress itself. 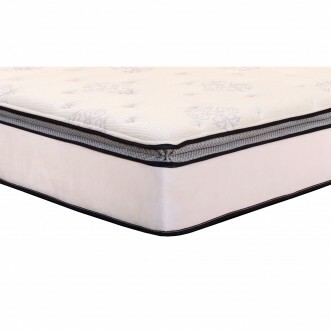 The pillow top is soft and includes 2 inches of gel-infused memory foam. Just like any memory foam, this one adapts to one’s body. However, while memory foam “melts” under body heat, it is generally rather firm. Not exactly firm, but firmer than many other types of foam. And yet, this is a pillow top, therefore, it is softer than regular memory foam and former than a typical pillow top. 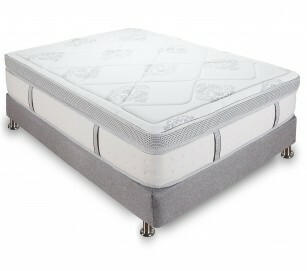 In combination, you have perfect support, no motion transfer and pressure relief specific to memory foam. And this mattress is made in America. If you’re feeling like getting a pillow top mattress, order this one on Amazon.com. This is another DreamFoam mattress. As you can see, the name sounds very similar to the previous one. More than that, this mattress is a modification of this mattress (without pillow top). Unlike the previous mattress, however, this mattress contains no memory foam. Instead, other than the pillow top, the mattress is made primarily of regular foam. No springs. No memory foam either. The mattress is four inches thicker than its counterpart with no pillow top. This mattress comes in 7 sizes: Twin, Twin XL, Full, Full XL, Queen, King, and California King. Naturally, it’s more expensive than the mattress without a pillow top. The Twin Size mattress costs below average, while the mattress with no pillow top of the same size would cost even less. And the mattress is made in the United States. While the basic support foam mattress cannot provide particularly luxurious sleeping experience, the pillow top changes things significantly. It might not relieve pressure points in a manner similar to memory foam, but it is soft, and that’s enough sometimes. Since it’s regular foam, it takes the mattress mere hours to inflate fully. And you don’t have to worry about it staying vacuum-sealed for long precisely because this is not memory foam. It’s also almost odorless. And it also reduces motion transfer. The mattress tends to soak fluids, so be advised. You might want to get a waterproof cover if you sweat a lot. 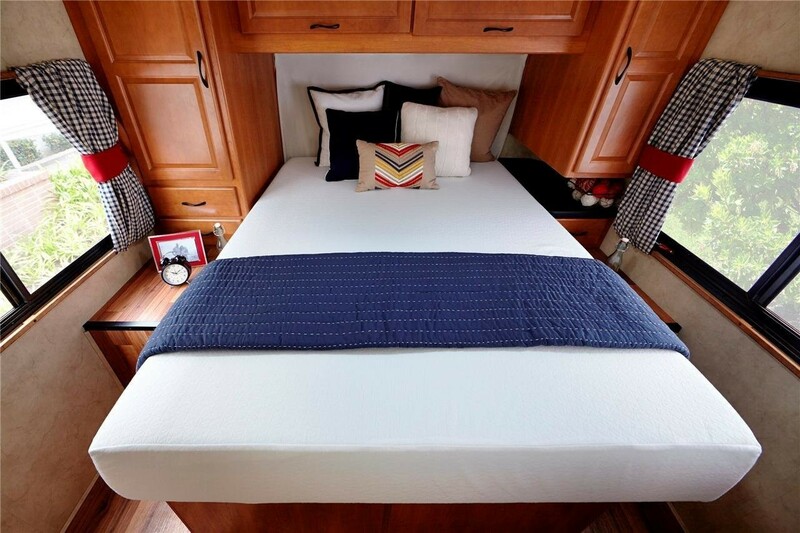 Despite that, it’s a good mattress that would work for any recreational vehicle, main bed or a guest bed. 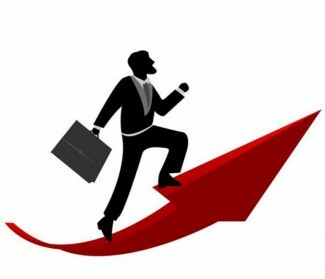 Don’t hesitate and read more than half a thousand reviews on Amazon.com. This is a King Size mattress. It has 1046 pocketed coils and is 14 inches thick. That’s a nice height, and the very amount of coils makes the support even more unique and comfortable. 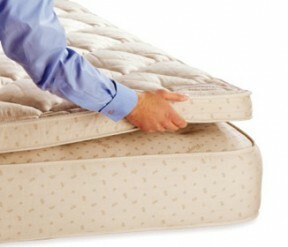 As you can expect, the mattress eliminates motion transfer and is very good for side sleepers. Of course, being a pillow top hybrid mattress, it is multi-layered. The first layer is made of fire-resistant fiber. 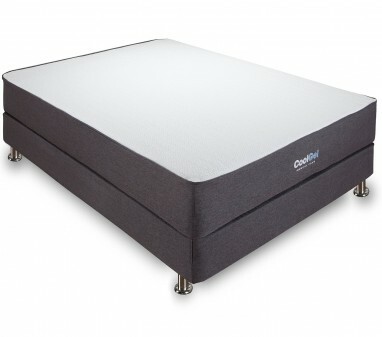 Then there’s Air Feel foam for luxurious support, plush comfort foam, AirCool memory foam for pressure relief, GelTouch foam and Energy Foam for the coils’ support. 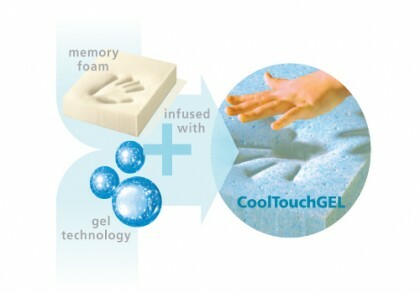 The gel-infused memory foam prevents heat-traps. As any pillow top mattress, this one is a bit soft. That’s the whole point. But it also provides perfect and precise support for you back, making your sleeping experience truly unique. And so, you can order it on Amazon.com. Surprisingly, air beds can also be pillow top. At least, this particular item. It is not intended for camping. It is primarily a long-term bed, although very few air beds are designed that way. You must understand that this mattress does not come with pillow top only. The pillow-top is merely a variation of the bed. But it’s the only relevant variation for when pillow tops are considered. First of all, this is a NeverFLAT air mattress. It has two electric pumps, one of which is used for inflation/deflation and the other for maintaining the desirable firmness level. Note that the mattress is a bit firm, but the pillow-top variety deals with that. The NeverFLAT pump is whisper quiet. The mattress comes with an auto-shut-off function and preinstalled firmness levels. The really important thing is that the pillow top variety is a lot warmer than any other air mattress. While sleeping on any other type of air mattress can be too cold, this is not an issue with this one. So make haste and order it on Amazon.com as soon as possible. This mattress doesn’t have 1046 coils like the one above, but it does have a thousand. Its height is nothing to scoff at either, albeit the other mattress is thicker as well. But what matters for us is pillow top. And the pillow top is three inches thick, to say nothing of the foam it is made of (it’s premium Denier Foam). 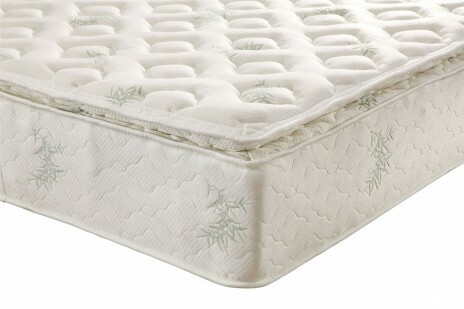 The coils are pocketed, but you don’t have to worry about collapsing edges since the mattress also has a border wire. Of course, the mattress eliminates motion disturbance, as you can guess. No more disturbing your partner! 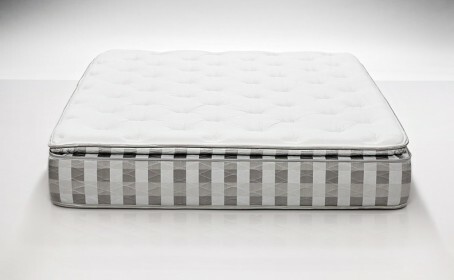 The mattress, despite being an innerspring mattress, even if it has a pillow top, is shipped vacuum-sealed. Just like any foam mattress, except it’s not foam. Well, the pillow top is, but the rest of the mattress is certainly not. But don’t let the size fool you! The mattress is very heavy and very unwieldy. Make sure you have it where you want it before unpacking. Relocating it again would be a pain in the neck. But if you want a good mattress, if you don’t want to deal with huge packaging, this might be the mattress for you. Buy it on Amazon.com and enjoy your new bedding! Again, a mattress made of regular foam. But the pillow top is a good compensation for it, don’t you think so? 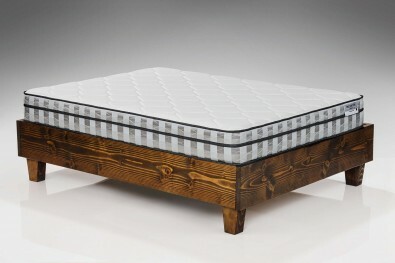 Made in America, this DreamFoam mattress is a crystallization of a premium regular foam mattress. It may have no qualities specific to memory foam, but what it does is providing support. The pillow top takes care of comfort. Coms in five sizes: Twin, Twin XL, Full, Full XL, and Queen. But since it’s not memory foam, it has no drawback specific to it either. The mattress barely smells and, what’s more important, it does not reflect heat back at your body. Granted, one can obtain gel-infused memory foam for cool-sleeping, but that solution would be more expensive than getting a regular foam mattress with a pillow top. Unfortunately, the pillow top makes it impossible to flip the mattress. Well, technically it is possible, but there would be no point in doing that. However, you can rotate it still. This is a good thing to do. The mattress is firm, but not quite—thanks to the pillow top. If you want to get it online, follow this link and buy it on Amazon.com. This is a hybrid mattress. It is multilayered and it comes with a pillow-top stretch-knit cover with quilting. That would be the top layer, but there are 8 more. The next three are made of memory foam (both gel-infused and otherwise) of varying density, comfort foam and fiber layers, and the base innerspring layer. The height of the mattress is fourteen inches. The inner springs are pocketed, and thus, they prevent motion transfer, which is good for those who don’t sleep alone. But with the pillow top having a corded edge you don’t have to worry about them collapsing, too much. That the main drawback of pocketed coils. It’s eliminated here. Thanks to that and the pillow top, the mattress is absolutely comfortable. The only thing you have to worry about is the smell. After all, it is a memory foam mattress as well, and odor issues are typical for them. But, just like with many other memory foam mattresses, the smell of this mattress is easy to get rid of. As far as hybrid mattresses go, this is the best one. And it has a pillow top. If you want it, don’t waste your time and order it on Amazon.com. The mattress is firm. But since it has a pillow top, it is not really an issue. The mattress is very comfortable, and while the support is firm, the top pillow top layer makes it vary cozy and adds a soft touch to it. Thirteen inches is a lot for an innerspring mattress, even if it’s a mattress made of six hundred independently encased coils. 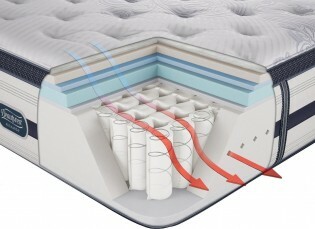 Just like any other pocketed coils mattress, this one eliminates motion disturbance. You don’t have to worry about that. Also, you don’t have to worry about any noise, since the springs are quite noiseless. There might be a bit of an issue in regards to the mattress’s dimensions. It’s possible for it to be a bit shorter than specified. Most people disregard that possibility. If you don’t worry about a line or half either, welcome aboard! Don’t forget to visit Amazon.com. Another memory foam mattress with a pillow top. The most peculiar feature of this mattress is the cold sleeping and ventilation, as the name itself suggests. 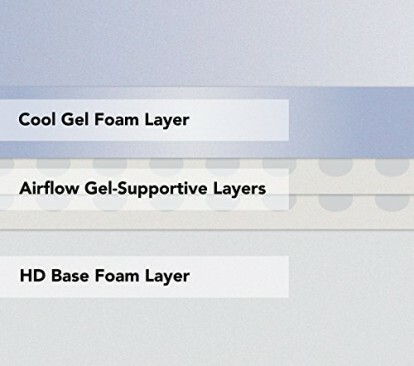 Not only is the memory foam layer infused with gel, but so are two support foam layers! And let us not forget about the AirFlow layer. All in all, this mattress is designed for cool sleeping. You shouldn’t even feel like it’s memory foam, well, temperature-wise anyway. 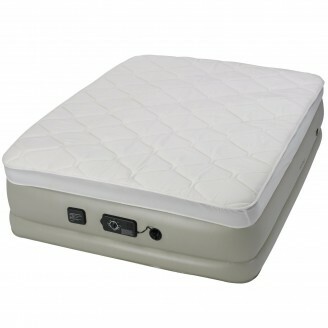 There are people who always suffer hot-sleeping when they doze off on a memory foam mattress, but not on this mattress. The mattress is ten inches and half thick. Thanks to the pillow top, it is very soft, even though it does provide all the support required. It’s compressed very tightly for the purposes of delivery, and that’s fairly convenient. The breathable top layer prevents you from sweating too much. And breathable four-way stretch knit top does not interfere with that. If you want a memory foam mattress that is cool to sleep on, this is your primary choice. Get this mattress on Amazon.com right now! This is somewhat unusual a mattress, although it is very good. It deserves the first place. But there are a few things you might want to know. First of all, it only comes in one size: Short Queen. That’s a disappointment, I admit it. But! This is a perfect choice for campers. It is a mattress for recreational vehicles. That said, there is some variety, just not in the size department. The mattress comes in two height varieties: 8 inches and 10 inches. That in itself is not something major and is easily ignored. But then there is the second kind of variety it comes in. You can get the memory foam type mattress. You can get the innerspring type mattress. That’s right! That’s what this type of variation is all about! This is not a mattress of some definite type. You can visit Amazon.com and order whatever variation you prefer! I don’t mean to say this is a hybrid mattress. It is not. It just comes in two varieties. 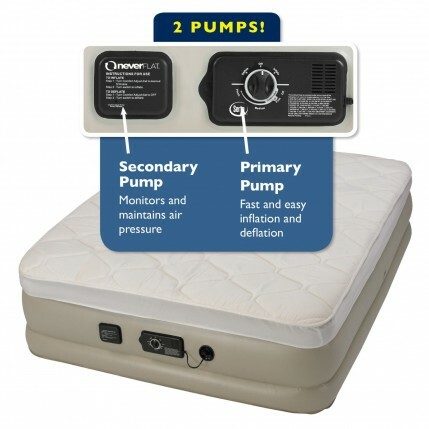 And the innerspring type is more expensive than the memory foam type. Why? Because this version is the pillow top mattress. 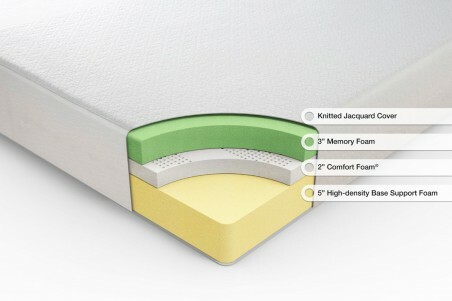 The memory foam mattress comprises a 3 inches memory foam layer, a 2 inches comfort foam layer, and a 5 inches high-density core foam. The foam is CertiPUR-US certified, of course. And the memory foam does not smell since it’s BioFoam. But it’s not pillow top. 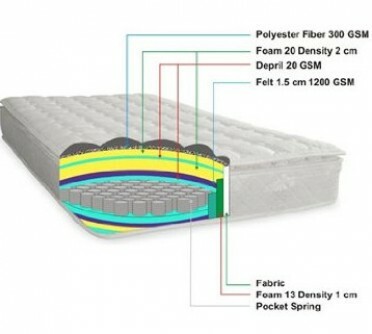 However, the innerspring mattress comprises a 1-inch comfort foam layer on tome of another layer 1.5 inches thick and a High-Density Support Foam layer. The base layer is the 7.5 inches thick innerspring layer. It comprises iCoil Pocketed Springs. This is a pillow top mattress and it’s very comfortable. You get perfect support from the coils, and any motion transfer is easily eliminated. But, other than the support, you get the feeling of feather light weightlessness. Even though this is not the memory foam variety, the mattress is perfect for pressure relief. Don’t hesitate and order it on Amazon.com! Pillow top mattresses are hardly any different from other mattresses. A pillow top mattress is basically the same thing as the mattress with no pillow top. The pillow top is a means of additional comfort and softness. If you’re looking for a pillow top mattress, you’re probably looking for softness, warmth, or, perhaps, fewer heat traps. After all, while pillow top is considered warm, it prevents memory foam form reflecting heat back at you too much. However, do not confuse a pillow top with a mattress topper. A topper is something separate from a mattress. They are sold by themselves and do not come with mattresses. You can just remove the topper if you don’t like the result, the same cannot be said about pillow top. 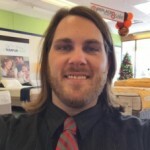 I have back problems and lower back, have Arthritis, I slept in my Daugther’s very expensive Memory Foam and doesn’t help me,i have a regular firm mattress not too comfortable. but I miss my previous Pillow Top. I gave away to a person that had no bed. I need an Honest help what to buy,can’t buy a very expensive one.